Discover the real Louisiana, with its small-town museums, fabulous festivals, outdoor recreational opportunities, centuries of history, culture, and stories and legends and the people that make it all come alive. Explore Louisiana’s Myths and Legends Byway—a 181-mile drive of Western Louisiana based on tall tales, true stories, and legends. Today, visitors will find the festivals that make Louisiana famous, lush pine forests, historic cemeteries, unique museums and mysterious waterways. The friendly hospitable people are always ready to share their stories. There are 22 kiosks to guide the way, creating a life-long travel memory. Be sure and stop in the local tourism center to get your own travel guide and game book. It gives a lot of information and is for young or old. In Louisiana, we are tied to the land and the water, by history, culture, and tradition. We live in the Outdoors. It is as much a part of our culture as our music and food. 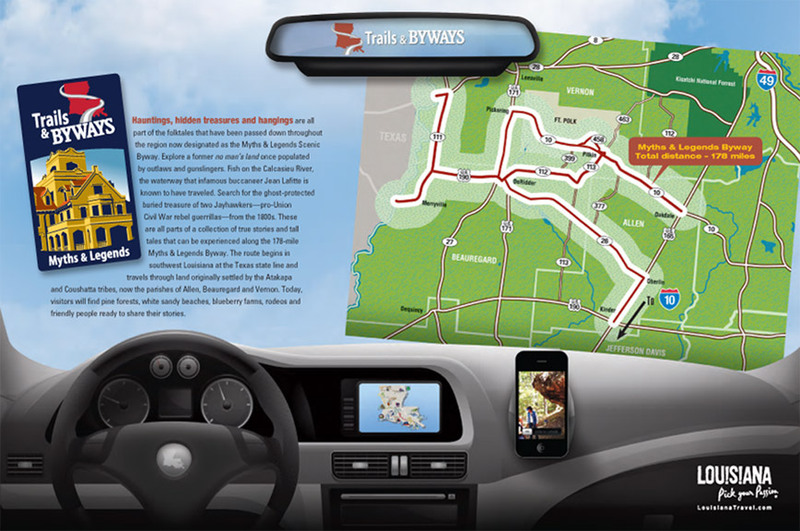 The Myths and Legends Byway meanders through miles of countryside, with many lakes, parks, wildlife management areas, and even a national forest. From canoeing the Ouiska Chitto and Sabine Rivers to biking on and off the Byway to hunting wild game to fishing in the creeks, bayous, ponds, and lakes, we have it all! Be sure and visit the local towns and eat at one of the many restaurants we offer. There are many Farmer’s Markets that sell local vegetables and home made goods. Contact a local tourism office for more details.